The Fantails are a homogenous group of distinctive Old World flycatchers found from India to Australia and many Pacific Ocean islands. The most familiar in Australia is the misnamed Willie-Wagtail (above, on a nest welded to a telephone line). It is a familiar garden and urban park species throughout Australia but also extending to New Guinea, the Solomons & the Moluccas. In your mind picture this bird in constant motion, swishing the open tail back and forth in an arc as it moves. I like this particular shot because it includes the dainty cup nest so typical of this group. Willie-Wagtail also has a musical "sweet, pretty creature" song (Simpson & Day 1996) that is distinctive. Most of this family have characteristic easy-to-whistle or trilled vocalizations. All the fantails are closely related and belong to a single genus: Rhipidura. Nearly all of them are very active with splayed-open tails swishing as they work through the mid-canopy or undergrowth. A widespread example is Malaysian Pied-Fantail of southeast Asia (left), recently split from Philippine Pied-Fantail R. nigritorquis. 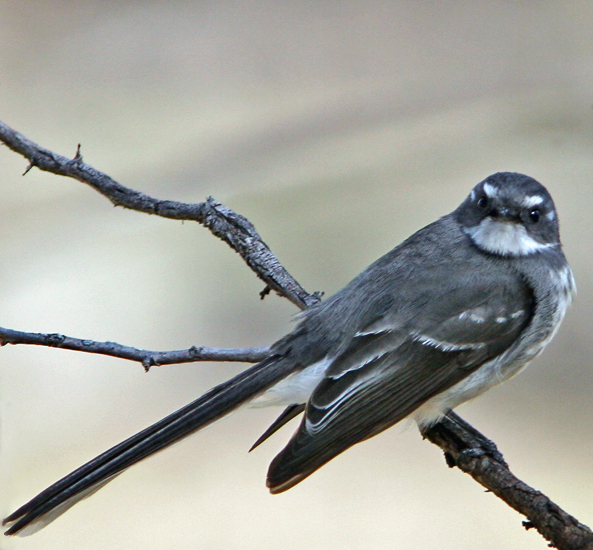 While Willie-Wagtail and Pied Fantail may be found in open areas, most of the family are birds of the dark shadows inside the forest. An example is Rusty-bellied Fantail (right), a Sulawesi endemic. 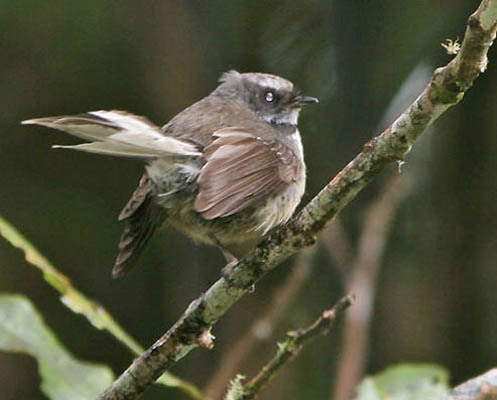 Most fantails are resident — including montane populations of White-throated Fantail (below) in Borneo — but Himalayan populations of this species move downslope in winter. White-browed Fantail (below left) is a widespread lowland and foothill fantail in India and parts of southeast Asia. Its typical stance is with the tail lowered. In contrast, many fantails — including New Zealand Fantail (below right) — typical perch with the tail cocked upwards. Gray Fantail (left) is a very widespread species in open woodlands of Australia, and with other populations scattered among the islands of Melanesia. Continued research (often supported by molecular evidence) as elevated various populations to species level. New Zealand Fantail was split from Gray Fantail some years back. More recently, various Pacific populations previously lumped with other widespread fantails have gained species status. Today, over 20 species of fantails are restricted to small islands from the Lesser Sundas to the Solomons to Fiji, Samoa, and Pohnpei. It would be a major accomplishment of island-hopping travel to see all of the fantails of the world. Long ago (1978!) I visited Pohnpei with my father and sister during a round-the-world summer vacation. We visited waterfalls, cultural events, and took a walk to the ruins of an ancient civilization. I still recall passing through the forest on that walk and enjoying several fantails. I remember these particularly since I was taken with the tail-twitching behavior. 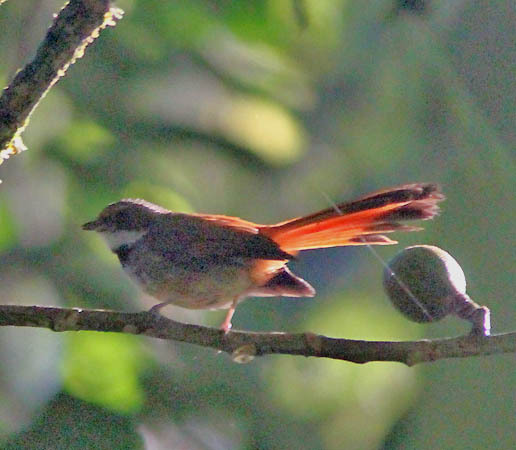 At the time the fantail on Pohnpei was considered a race of the widespread Rufous Fantail R. rufifrons (e.g., Baker 1951) but now they are split as an endemic species, Pohnpei Fantail R. kubaryi. In fact, this species was split before we had DNA evidence. Pratt et al. (1987) wrote: "this form was classified as a subspecies of Rufous Fantail by Mayr and Moynihan (1946) in a study based entirely on museum specimens. Although we agree that the two are closely related, our field observations indicate that they should probably not be considered conspecific. In addition to the very striking plumage differences, the two have distinctive vocalizations and foraging behavior." This split was followed by Sibley & Monroe (1990) and everyone else since then. I acquired it was an "armchair lifer" when doing research for the first version of this page back in 2001. The center for fantails in the world is New Guinea. Dale Zimmerman did a fabulous job on this plate (right) published in the Birds of New Guinea field guide by Beehler et al. (1986). This plate is a wonderful work of art. I know this because several years back I had the opportunity to purchase an original plate from Birds of New Guinea, and this is the one I chose. Today the original hangs in my front room, and I look at it every day. Rufous-backed Fantail R. rufidorsa (right bird, second row). Sooty Thicket-Fantail R. threnothorax. 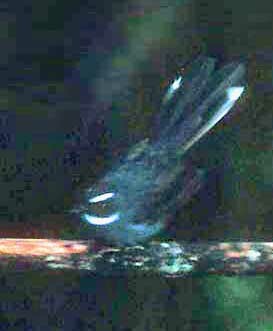 I have not seen the Black Thicket-Fantail but my experiences with the others are that they are very hard to observe without a tape, and that I taped them up by accident by recording unknown by distinctive songs. below which are the head of a female and the entire body of Black Monarch Monarcha axillaris, which is not a fantail at all but is often confused as one because of its similar behavior. The small fantail in the center below the bottom set is the Friendly Fantail R. albolimbata, a tame montane species that wig-wags through mid-canopy and sometimes up high in the canopy. At lower left is Northern Fantail R. rufiventris; it perches upright, acts like a typical flycatcher by sallying out after insects, and rare wags its tail. At the bottom is Mangrove Fantail R. phasiana that lives in its namesake habitat. Finally at lower right is Willie-Wagtail R. leucophrys, the bird whose photo appears at the top of this page. As you can see it is a large wagtail, it stands and feeds on the ground, and it is aggressive. It also follows cattle which is sort-of cool for a passerine. 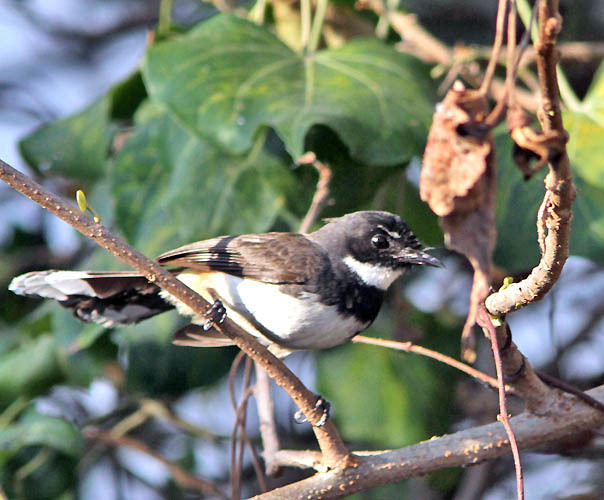 Photos: The nest-sitting Willie Wagtail Rhipidura leucophrys was on Halmahera I., Indonesia, on 7 Oct 2011. 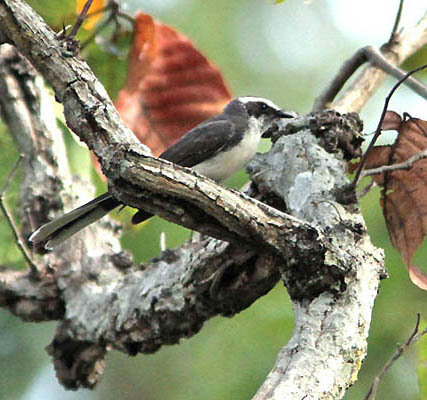 The Malaysian Pied-Fantail R. javanica was at the Muang Boran fish ponds near Bangkok, Thailand, on 31 Dec 2012. The Rusty-bellied Fantail R. teysmanni was at Gunung Ambang NR, Sulawesi, Indonesia, on 5 Oct 2011. The White-throated Fantail R. albicollis was on Mt. Kinabalu, Borneo, Malaysia, in Aug 1988. The White-browed Fantail R. aureola was at Sab Sadao, Thap Lan NP, Thailand, on 27 Dec 2012. The New Zealand Fantail R. fuliginosa was at Manginanga, North Is., New Zealand, on 15 Nov 2009. The Gray Fantail R. albiscapa was on Gulpa I., New South Wales, Australia, 31 Dec 1997. 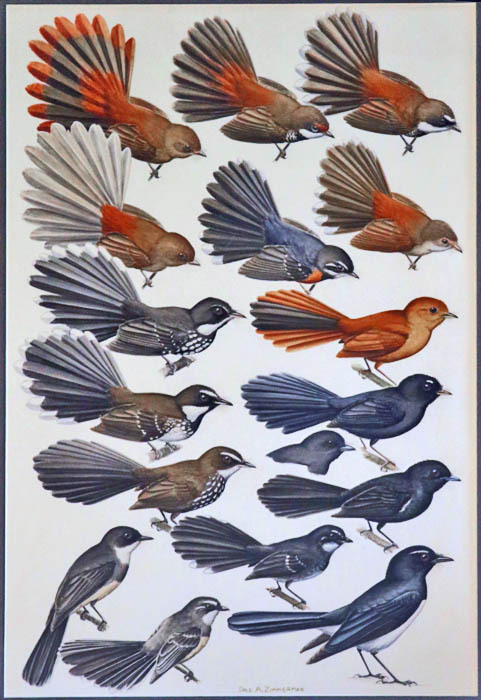 Dale Zimmerman painted the Fantail plate from Birds of New Guinea, 1st ed. (Beehler et al. 1996). Photos © Don Roberson; all rights reserved. Bibliographic note: There is no "family book" per se, but a fine introduction to this family, with excellent photos, is in Boles (2006). Andersen, M.J., P.A. Hosner, C.E. Filardi, and R.G. Moyle. 2015. Phylogeny of the monarch flycatchers reveals extensive paraphyly and novel relationships within a major Australo-Pacific radiation. Molec. Phylog. Evol. 83: 118-136. Baker, R. H. 1951. The Avifauna of Micronesia, its Origin, Evolution, and Distribution. Univ. of Kansas publ. 3: 1-359. Beehler, B. M., T. K. Pratt, and D. A. Zimmerman. 1986. Birds of New Guinea. Princeton Univ. Press, Princeton, N. J. Clements, J. F. 1991. Birds of the World: A Checklist. 4th ed. Ibis Publ., Vista, CA. Boles, W.E. 2006. Family Rhipiduridae (Fantails), pp. 200–243 in Handbook of the Birds of the World (del Hoyo, J., A. Elliott & D.A. Christie, eds). Vol. 11. Lynx Edicions, Barcelona, Spain. Coates, B. J. 1990. The Birds of Papua New Guinea. Part II. Dove Publ., Ltd., Alderley, Australia. Mayr, E., and Moynihan, M. 1946. Evolution in the Rhipidura rufifrons group. American Mus. Novit. 1144: 1-11.